While known today as a global leader in power steering and diesel engine pump technologies for the commercial vehicle industry, R.H. Sheppard Co., Inc. was founded by Mr. R. H. Sheppard out of a love for diesel engines. In 1937, Mr. Sheppard purchased a going concern located in a one story factory on East Middle Street in Hanover, Pennsylvania, along with the rights to produce the existing product lines of that business – the Kintzing wire cloth loom, floor polisher and gas engine generator. These products provided the basis of the manufacturing facility, and production of these products continued for some time. 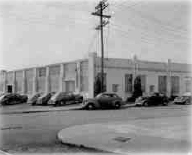 Perhaps most importantly, the Middle Street plant served as a place where diesel engines could be developed. The first diesels were produced experimentally as early as 1933, after Mr. Sheppard graduated from Dickinson College. As various uses were found for the diesel engines and business prospered, the other product lines were phased out. In all, twenty basic models of engines were developed and marketed throughout the world. These engines were used to power generator-sets, pumps, life boats, rescue craft, refrigerated railroad cars, and farm tractors. The diesel engines were the first love of Mr. Sheppard, and he searched for a long-term use for thirty years. The engines were produced from the 1930’s to 1963. In 1949, the company conceived the idea of repowering a Farmall M International farm tractor with a 3-cylinder Sheppard Diesel. Although this conversion was not a great success, it did lead to the introduction of the Sheppard farm tractor. This 3-cylinder tractor was the first diesel produced in the United States. The tractors were manufactured in 1, 2, 3 and 4 cylinders, with a range of 5 to 58 horsepower. The larger tractors featured full hydraulics, a spring balanced seat and a full line of implements. These tractors were some of the first to be fitted with a back hoe, front end loader, cultivators and planters. The patented “firsts” included a torque convertor with a 13-speed transmission and high ratio power steering. Although these tractors were the leaders in innovation in design and fuel economy, it would be many years before the diesel became the standard for farm use. These tractors were produced until 1956 when a recession coupled with floor planning by International Harvester and Ford made the production uneconomical and they were discontinued. 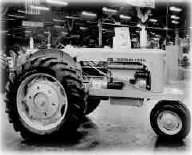 The first power steering gear was applied to the SD-4 tractor in 1953, and soon would find its way to heavy duty trucks. In 1963, R. H. Sheppard totally committed the company’s manufacturing and engineering resources to the production of power steering. Over the years, the company has been issued more than fifty patents on steering and related technologies, from both R. H. and Peter Sheppard. This continued commitment – to produce the highest quality steering components possible – led to the introduction of the M-series family of gears in 1986. The M-series includes five basic models, with several hundred variations of those models in our system. Today, R.H. Sheppard Co., Inc. has established itself as a global leader in power steering technologies with the introduction of the D-series family of power steering gears and the continued development of the M-series. In addition, the company continues to develop and introduce new steering system products including miter and t-boxes, miter columns, steering columns and other linkages. In addition, the company also manufactures fuel injection pumps for diesel engines and produces custom, high-precision iron castings for use in the fluid power industry. To support this commitment, the company has over 900 employees throughout our more than 800,000 square feet of foundry and manufacturing facilities. Most of our manufacturing plants, remanufacturing facility, pattern shop, and foundries are located in Hanover, Pennsylvania, with the exception of a machining facility in Wytheville, Virginia. We take great pride in our integrated manufacturing, where we produce 95% of the steering product components in-house. Our foundries produce ductile, austempered ductile, gray and compacted graphite iron for use in our products, as well as other customers’ products. Our products are used throughout the U.S. and Canada, as well as numerous foreign countries around the world. In 2008, to support our customers’ growth in the Asia Pacific region, the company partnered with a Chinese engineering company to provide highly-toleranced custom castings. This partnership has grown to include a partnership with a Western machining house to provide high-precision machining services in China. Most recently, the company has partnered with a Chinese steering gear manufacturer to produce power steering gears for the Chinese market, currently the largest heavy truck market in the world. Whether the product is power steering for the transportation industry, engine pumps for cleaner, more efficient engines, or certified castings – our focus and our success has been to provide the highest quality products and the best service possible. In September 2017, WABCO Holdings Inc. (NYSE: WBC), a leading global supplier of technologies and services that improve the safety, efficiency and connectivity of commercial vehicles, announced that it has completed the acquisition of RH Sheppard Co., Inc. Moving forward, Sheppard will be fully integrated into WABCO’s North America Business Unit, with its technology becoming part of WABCO’s extensive Vehicle Dynamics and Controls Business.